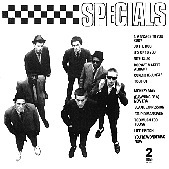 The Specials helped ignite the second wave of ska with their self-titled 1979 debut, produced by pop mastermind Elvis Costello. A danceable mix of punk, ska, and R&B, The Specials were a rock 'n' roll band in every sense of the word. Though they preferred the early sounds of Jamaica to the Chicago blues that had ignited bands like The Beatles and The Stones more than a decade earlier. A classic, Chrysalis/Capitol is re-releasing this treasure, which sounds as vital today as the day it was recorded. Songs such as "A Message To You Rudy", "Concrete Jungle", and "Monkey Man" are pure ska. I'll give this an A.